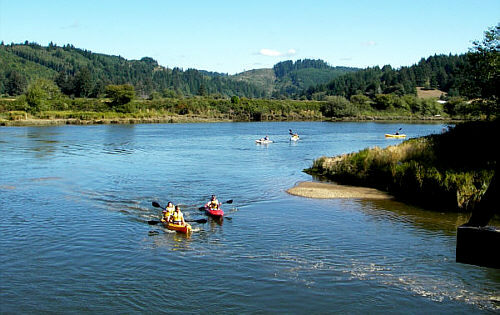 The water trail provides over 30-river miles of paddling opportunities along the North Fork and Siuslaw Rivers between Mapleton, Oregon and the Pacific Ocean. Paddle from the head of tide through the beautiful Estuarine Islands Coastal forests, Sand Dunes, and historic waterway with a centuries-old heritage of people making a living from forestry and fishing. The interactive Google map can help you review the trail itinerary. This site also offers downloadable maps, each containing detailed descriptions of the river and pointing out places of interest. The maps can be downloaded and printed directly from the website or you can contact the Port of Siuslaw, The Siuslaw Watershed Council, or the Local Paddle shop for more information on where to paddle, current river conditions, and paddle information. 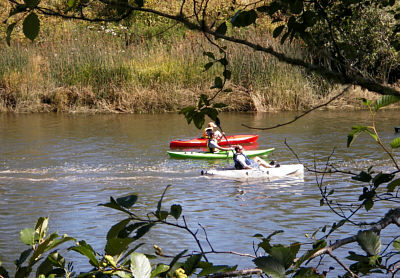 The water trail is part of the Central Coast Water Trail System. 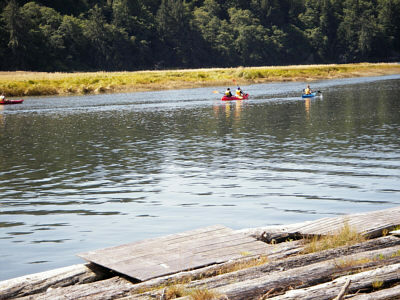 Along with the Siuslaw Estuary Water Trail, there are dozens of coastal lakes and rivers to paddle and explore. 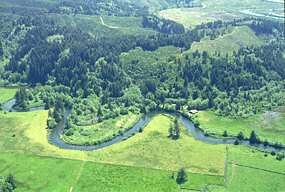 Please consult the Siuslaw Watershed Council, local paddle shops and outfitters for more information about these areas. Click below to download SWT brochure into a new browser window. You can then print it directly from your browser or right-click and save to your computer. The key to an enjoyable trip on the water trail is advance planning and safe boating. The information in this page will assist you in preparing for your trip. Also consult the section on safety for additional information and what equipment to bring. 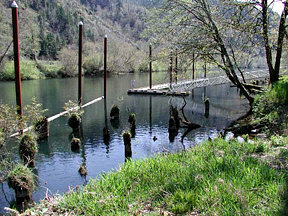 The Siuslaw River contains both motorized and non-motorized watercraft, depending on the stretch of the river, flow conditions, and season of the year. 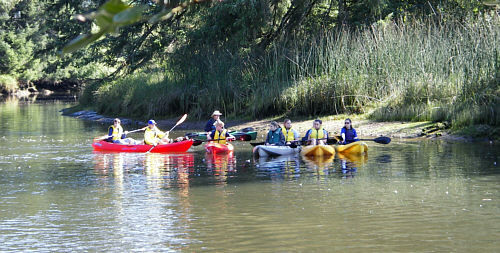 Experienced paddlers can paddle the river from Florence to Mapleton as a day trip, depending on wind and tides. The average speed of a canoe or kayak powered by two adults is 2-4 miles per hour. Novice boaters should start with trips of 2-4 miles and work up to longer paddles. It is important to remember that the lower Siuslaw river and estuary are influenced by tidal movement, wind and ocean conditions. Your time of paddling can be greatly reduced or enhanced depending on how you time the tides, and on the direction and strength of the wind. Be sure your experience level matches the trip - some sections may be more challenging than others. If you are a novice boater or unfamiliar with the river it is suggested that you complete a boating training course or go with an organized trip, before setting out on your own. Check the local guide shops for assistance planning a trip or to schedule a guided trip. All paddlers should have and wear a life vest with a whistle attached. Bring water and extra clothes and rain gear in a dry bag. Check the tides and weather forecast before you set out. Note that it may be difficult to launch your boat at low tide at several of the launch sites. Generally mornings are calmer and easier paddling that afternoons, especially on the section of the river near Florence. Please be aware that river conditions can chance quickly and dramatically. Weather such as rain and wind can kick up without warning and swells can increase at a moments notice. Also be aware that the closer one paddles to the mouth of the river the greater the danger due to increased currents, wave energy and ocean conditions. Do not drink water from the river or tributaries. Water and food are available in Old Town Florence, Cushman and Mapleton. Much of the land along the water trail is privately owned. Do not trespass and camp only at officially designated areas. The good will and stewardship of private landowners are essential to sustaining the water trail and the river itself. At this time the only camping allowed along the Siuslaw Estuary is available at the Port of Siuslaw campground located at the east end of Old Town Florence. Nearby camping is available in the Siuslaw National Forest campgrounds and various private camp sites located directly to the north and South of Florence, and to the east of Mapleton, Oregon. Please note at this time there is no dispersed camping available along the river and that private land should be respected at all times. Be prepared for varied conditions! It is critical to safe paddling that all participants have the training, skill, and experience, including self-and assisted-rescue techniques. Gather as much information as you can about the route and any potential hazards before leaving. Attain up-to-date weather forecast, tide chart information, local knowledge about the route you will be paddling. Be alert for larger, motorized boats. 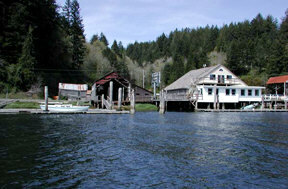 Stay along the river’s edge and steer well clear barges, and larger fishing boats. Wear your life jacket. Some 80 percent of all recreational boating fatalities happen to people who are not wearing a life jacket. Expect to get wet. Even the best paddlers sometimes capsize or swamp their boats. Bring extra clothing in a waterproof bag. Signal Devices. All boats are required to show a white light in dusk, dark or fog. For paddling boats, a flashlight is acceptable. Other useful signaling devices are flares, dyes, glow sticks and signal mirrors. A VHF radio or cellular phone could be used to call for help but may not be reliable in all locations. Be prepared to swim. If the water looks too hazardous to swim in, don't go paddling. If you capsize, hold on to your boat, unless it presents a life threatening situation. If floating in a current, position yourself on the upstream side of the capsized boat. Scout ahead whenever possible. Know the river. Avoid surprises. Be prepared for the weather. Get a forecast before you go. Sudden winds and rain are common and can turn a pleasant trip into a risky, unpleasant adventure. Wear wading shoes or tennis shoes with wool, polypropylene, pile or neoprene socks. Never boat alone. Boating safety increases with numbers. Keep painter lines (ropes tied to the bow) and any other ropes coiled and secured. Never tie a rope to yourself or to another paddler, especially a child. If canoeing, kneel to increase your stability before entering rougher water such as a rapid or large swell. If you collide with an obstruction, lean toward it. This will usually prevent capsizing or flooding the boat. File a float plan with a reliable person, indicating where you are going and when you will return. Remember to contact the person when you have returned safely. Trip Planning. Recognize your level of experience and look for trips that match your skills, knowledge, and fitness. Please note that it is suggested that for increased safety please paddle in groups. Groups should travel close and make crossings together, keep in voice contact, and have someone volunteer as "sweep," responsible for keeping pace with the slowest paddlers. One wearable Coast Guard-approved Personal Flotation Device (PFD or life jacket) in serviceable condition and of the appropriate size is required for each person in your boat. Power boats 16 feet or longer must carry one throwable device (seat cushion or ring buoy). PFD's must be worn by children 12 years and younger while underway on boats 20 feet or less in length and all canoes and kayaks. Others are strongly encouraged to wear a PFD. Operating watercraft, including canoes, kayaks and rafts, under the influence of alcohol or drugs is illegal. The law is actively enforced for user safety. The Port of Siuslaw is pleased to work with the Siuslaw Watershed Council in the establishment of the Siuslaw Estuary Recreational Trail System. The Siuslaw River is one of the most scenic rivers on the Oregon Coast and offers the boater an up close enjoyment of nature. 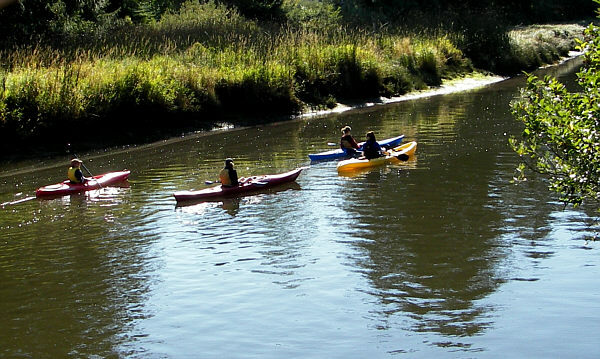 Water sports enthusiasts can put in kayaks or canoes at the Port of Siuslaw, Mapleton, or up the North Fork of the Siuslaw, tour around islands in the river, pass by scenic Old Town Florence as well as the historical Highway 101 Bridge over the Siuslaw River. In addition to bicycling, hiking, and other outdoor activities, this water trail is close to ocean beaches and the City of Florence. We welcome and invite you to explore the beauty of the Siuslaw River watershed and hope to see you soon!